Don’t let it fool you!! Most of the routes are easier, but it can get steep and dicey. This formation is only about 300 feet high, it is easiest to approach (from the Lake Marie Parking lot) and melts out first. Climbing usually begins here in mid-May. Descent is by 1.) the Medicine Bow Peak Trail (MBPT) or 2.) the bolted quick rap route indicated on the topo. 1.) First Grade, 5.7. Scramble up to an obvious pine tree and begin over blocky ledges. Belay at the major arete of the formation. One pitch. 2.) Second Grade, 5.8. Ride the arete all the way, belaying at a convenient ledge. Two pitches. Photo immediately below. 3.) Third Grade, 5.9. A medley of aretes and dihedrals. Two pitches. This is adventurous climbing at a moderate grade. Photo immediately below. a.) 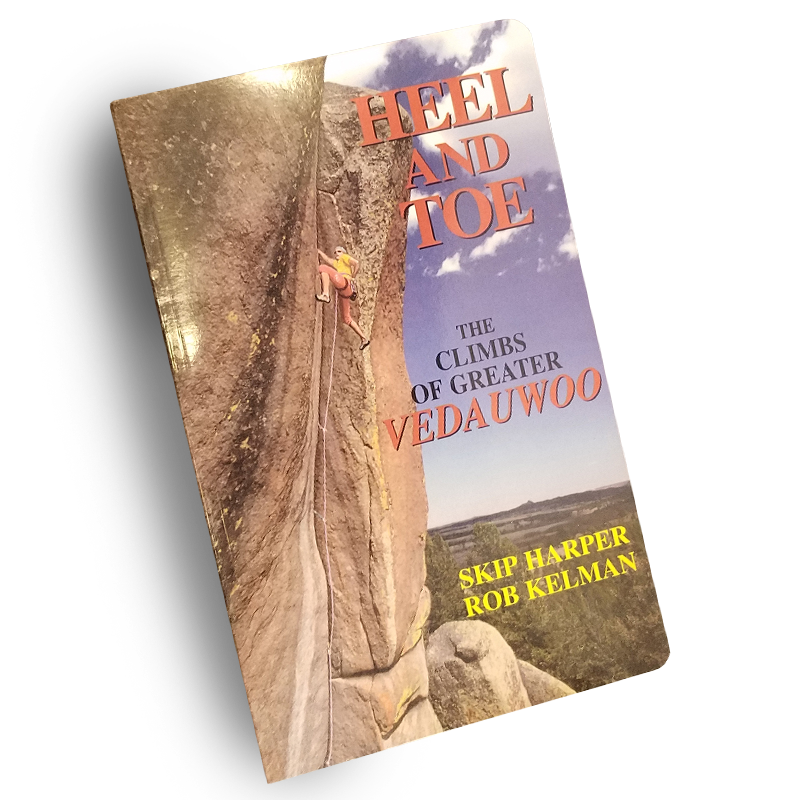 Go left under the prominent roof and take the face to the top (5.7). b.) Take the dihedral straight on (5.9+). c.) Head for the roof on the right (10c). d.) Lay away the big dihedral to the right (5.7). a.) Take the big arete to the prominent roof above, turn the roof and finish on the face (5.7). b.) A long dihedral with a dicey move near the start (10c). c.) An obvious crackline with face moves near the top (5.8). a.) Take the large dihedral and turn the largest roof then face moves to the top (5.9). b.) Thin face beginning about 15 feet above ‘C’ with thin cracks and sharp edges (10c). 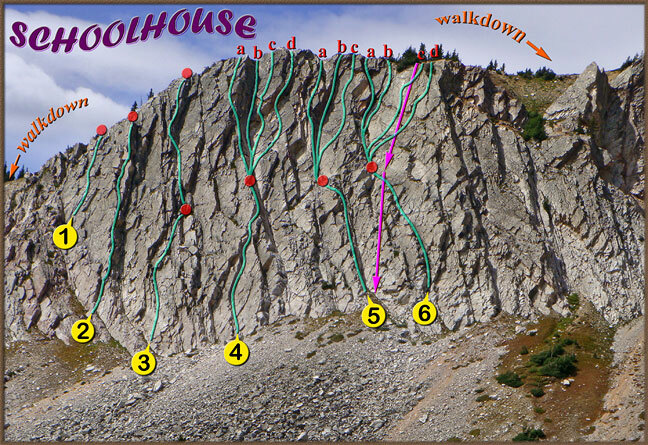 c.) Sporty face of near white rock with an interesting traverse (crux) to a bolted belay (10a/b). Photo below is Rob Kepley firing up this route. d.) A large crack line going thru an “A” shaped roof originally described in Jaquot (5.8). Go hard left near the top to the bolted belay.